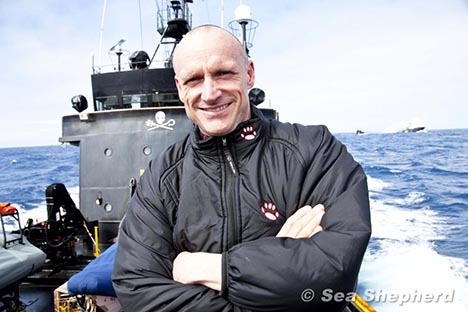 Sea Shepherd’s 2009/2010 campaign to disrupt Japanese whalers in the Southern Ocean will be remembered for two names: the ship Ady Gil and its skipper, Pete Bethune of New Zealand. Pete had been captain of the carbon-composite, high-tech trimaran when it was called Earthrace and purchased for the Sea Shepherd Conservation Society (SSCS) by millionaire Ady Gil. The futuristic-looking vessel sank after the Japanese harpoon ship Shonan Maru II rammed it on January 6. 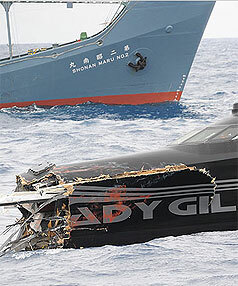 A month later, Pete managed to leap from a Jet Ski and board the Shonan Maru II while the whaler was making 14 knots and avoid anti-boarding spikes along the way. His objective was to attempt a citizen’s arrest of the captain of the Shonan Maru II for the destruction of the Ady Gil and attempted murder of the six Ady Gil crewmembers. Or maybe not. Pete was promptly taken into custody by the ship’s crew, held for 24 days and returned to Japan for trial. Charges included trespassing and assault on a whaler (apparently Japanese poachers don’t like being hit with rancid butter). Pete received a two-year sentence, which was then suspended, and he returned to New Zealand in July. He’s now working on a book. The other day I had the chance to chat with him. 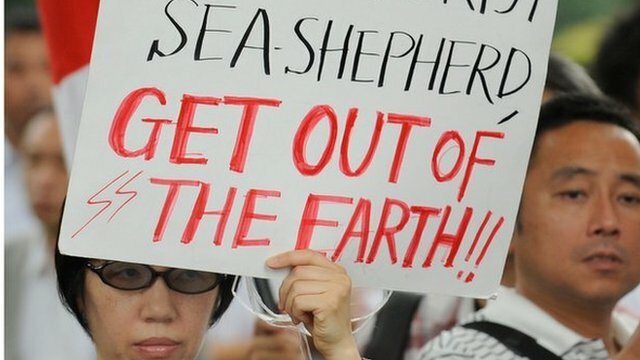 What was your involvement in the anti-whaling movement prior to Ady Gil buying Earthrace for Sea Shepherd? None really, other than being pissed off at the Japanese. In New Zealand, we all know [illegal whaling] happens in our backyard, but we feel powerless to do anything. SSCS gave me an opportunity to do something. Whaling remains deeply offensive to Kiwis and Aussies. You’ve been writing a book. What it is about? It is about how I got involved with SSCS, getting to Antarctica, getting rammed, prison in Japan and coming home. It also has a lot of my ideas on how we are stuffing things up these days and my views on energy, the planet and conservation. It will be published in New Zealand and Australia in November this year, and then the USA, Canada and UK next year. There’s been a lot of debate about whether or not Captain Komura of the Shonan Maru II deliberately ran down the Ady Gil. Do you have any doubts it was intentional? It was definitely intentional. I think he wanted to hit our front and put us out of the campaign, but maybe not hit us so far back. He was a really aggressive little bugger, all through the campaign, and a smack on our bow would have been a great result for him. Get the boat that is wreaking havoc out of the campaign. But he misjudged it, we never went into reverse, and the rest is history. I hope he wasn’t trying to kill us! Incredibly dangerous what he did, regardless. Paul Watson has said that banning you from Sea Shepherd was a legal ploy, and that you are welcome to rejoin the group. Do you think you’ll go back? I hope so. I am in talks with them at the moment about joining the next campaign and possible tactics, but nothing definite. You must have known you would be arrested the moment you set foot on the Shonan Maru II. Was there a larger plan at work? The plan was always to go to Japan and get media there. The Japanese public are very hard to connect with. By getting to Japan, we hoped to get traction with the Japanese media. How well do you think that worked out? We got massive media there, but much of it was negative. But overall it was certainly a success. You can’t please everyone. In court, there was no discussion of why you boarded the Shonan Maru II, and Captain Komura was not called as a witness. Was there ever any question what the outcome of the trial would be? It was always inevitable I would be found guilty. The conviction rate [in Japan] is over 98 percent! That they sank my boat had no bearing on the trial. It is irrelevant to the Japanese. You received a two-year suspended sentence. How much jail time did you have to serve? I did 5 months locked up, which included 24 days on the Shonan Maru II. How did your fellow prisoners treat you? They thought I was evil and dangerous and steered well clear of me. Did anything good come out of the experience for you personally? Yes. I have a healthier outlook on life. Every day is a blessing now, and I am a little more focused than before. And my tolerance is really high now: I have not been pissed off about anything since coming out. Update: In January 2013, it was announced that Pete had sold the rights of his book to a movie producer.